The #555 over the Port Mann Bridge now does stop in Surrey. In fairness, bus service south of the Fraser has improved in other respects. Most notable is probably the 96 B-Line in Surrey. Your point on the lack of Coquitlam-Surrey direct bus is an interesting one. I looked at bus service between the LRSP designated Regional Town Centres. It seemed to me to be a reasonable objective to connect these up with direct services. And, at the time, I was frustrated by the very indirect transit routing I had to use to commute between Richmond and Metrotown. This eventually got provided by the #430. My concept had been that this needed to be an Express/Limited Stop service. Even now Translink’s trip planner suggests you use Canada Line SkyTrain via Vancouver. When we were campaigning against the widening of Highway #1 we pointed out that there was no bus service across the Port Mann Bridge. The excuse used was traffic congestion, but it would have been straightforward to provide bus only lanes on the shoulders as was done on Highway #99 later. We not only proposed what became the #555 but also a direct bus from Surrey Centre via Guildford to Coquitlam – also as an Express service, which would have been much faster than bus from Guildford to Surrey, Expo SkyTrain to Columbia, Millennium to Lougheed Mall, bus to Coquitlam. For most other adjacent Regional Town Centre pairs transit links are pretty good. re; #430 Even now Translink’s trip planner suggests you use Canada Line SkyTrain via Vancouver…as google does…that is certainly because it is the best option (it is always faster). As has been discussed on the skyscraper forum, the Canada line has made this route, which is already an Express/Limited Stop service, “pointless”, (I have chimed here linking on some previous posts revolving on the #430) . Stephen, the Port Mann Bridge is still supposed to activate lanes that are dedicated for Surrey-Coquitlam traffic, because half of the bridge’s traffic is supposed to enter Hwy 1 at Surrey and exit at Coquitlam. If the bridge was built with this in mind, why not transit? I haven’t yet put that question to TransLink but it sure sounds like a legitimate one. Further to that, it seems it might be logical for the 96 B-Line to keep going east on 104 through Guildford, hit Hwy 1 westbound at 156 and go to Coquitlam centre and back. Having seen a sneak peek of the proposed translink referendum on the news yesterday, I sure hope there is a ‘none of the above’ option. I am so disappointed with what I saw. The 3 choices leave us with 2 options of automobile drivers paying 100% of future transit projects, and the third option has the whole province paying for the lower mainland’s transportation, which seems even more ridiculous. Why isn’t there an option that includes the actual transit users funding this gold plated wishlist? I mean really, skytrain to Langley? They have a population of 50,000 yet we are going to spend hundreds of millions to bring the most expensive transportation system in the world to such a small community? Why didn’t the mayors contenplate other forms of transport, like LRT? The mayors feel like a referendum is the wrong way to go. The public should not be able to make these kinds of decisions. Mayor Walton has even gone as far as to say that the public always makes the wrong choice. Maybe they filled the ballot with poor choices they know nobody wants so the whole thing fails, and then they can make the decisions for us idiots. Why isn’t there an option that includes the actual transit users funding this gold plated wishlist? They already do. It’s called a farebox. A two-zone transit fare is MORE than the toll on the exorbitantly overbuilt Port Mann monster bridge. Talk about a “gold-plated” transportation wish list. Since when does $10 billion in highway expansion, the widest bridge in the world – and another 10-laner to the pumpkin patches of Delta on the books — NOT constitute a gold-plated gift to the suburbs? Many of us take transit and pay a toll with every trip no matter where it is, but also own economy cars and modest homes in the city and pay through our noses to subsidize the massive suburban freeway network we rarely use through fuel and property taxes. Where is your analysis and research to back your opinions, Nancy? We should have a “like” button! Thanks MB! too many B.C. car drivers think that free motorways are a birthright! As for the TransLink referendum it looks like the questions will ensure that the referendum fails.. Neither the mayors nor the Stone that C. Clark threw at the mayors to trip them, have ever bothered to see that they do on the other side of the border.. If voters in 2016 approve a third big transit plan, the additional tax rates might look like this to build $15 billion of mostly rail projects — a similar size to transit packages voters passed in 1996 and 2008. • Sales-tax increase equaling 55 cents per $100 purchase; or • Property tax equaling $420 yearly on a $400,000 home; or • Motor-vehicle excise tax equaling $160 to renew license tabs for a $10,000 vehicle. If costs are spread among three kinds of tax, the rates would be: • Sales-tax increase equaling 18 cents per $100 purchase; and • Property tax equaling $140 yearly on a $400,000 home; and • Motor-vehicle excise tax equaling $53 to renew license tabs for a $10,000 vehicle. I shop carefully and don’t have a car, but pay property taxes, so I would vote for the combination of 3 taxes..
@MB, all the road improvements that are being done are to accomodate the trucks which will be bringing our increasing exports to ships in the ports. That is why the Port Mann, Golden Ears, the Delta road expansion, and the Massey tunnel are getting redone. It has nothing to do with helping commuters. Everything you eat, touch and want comes from a ship, which is brought to stores via semi trucks, on those very roadways that you think should be left to crumble! Even the fuel for your car and the bus you take is trucked in. I too pay already for transit via property taxes and fuel surcharges, and I do not agree with funding the most expensive transit option available. Your asking for an analysis of what? How much skytrain costs compared to LRT? It is a known fact that skytrain costs more to build than any other mode of public transport. I’ve already done my research and now you want me to do yours too? If you spent as much time researching costs as you do to write your post, you will find that what I say is true. BTW, I don’t live in the suburbs either, so what’s your point? Sorry Nancy but you really do not understand how our ports operates. Firstly, the vast majority of exports are bulk cargoes like coal or grain that arrive by train. Canada’s manufacturing industry has declined and anyway was always oriented to export to the US. There is a huge build up of empty containers in North America, as so many are needed for imports and so few are used for exports. The busiest truck route in the region used to be the Port Mann Bridge before the SFPR and the introduction of tolls. Trucks then comprised 8% of the vehicles – and most of those were travelling locally, not entering or leaving the region. Since then, of course, trucks have moved to the Patullo Bridge to avoid the toll. Secondly the Gateway Program talked a lot about trucks – and the port – but that was PR fluff. The major beneficiaries were always the developers who were enabled to continue to build suburban sprawl in much of the region. Instead of following the agreed regional strategy, car dependence was increased. Kevin Falcon held a series of breakfast meetings across the South of the Fraser explaining to developers and real estate companies how the expansion of Highway #1 would work to their advantage – and raised much of his re-election campaign funds that way. Transit is a far more efficient use of space than cars. A three metre wide strip of land can accommodate either a lane of traffic or one railway track. The highest throughput of vehicles on a freeway lane is 2,000 per hour – carrying far less than 3,000 people at current average occupancies. 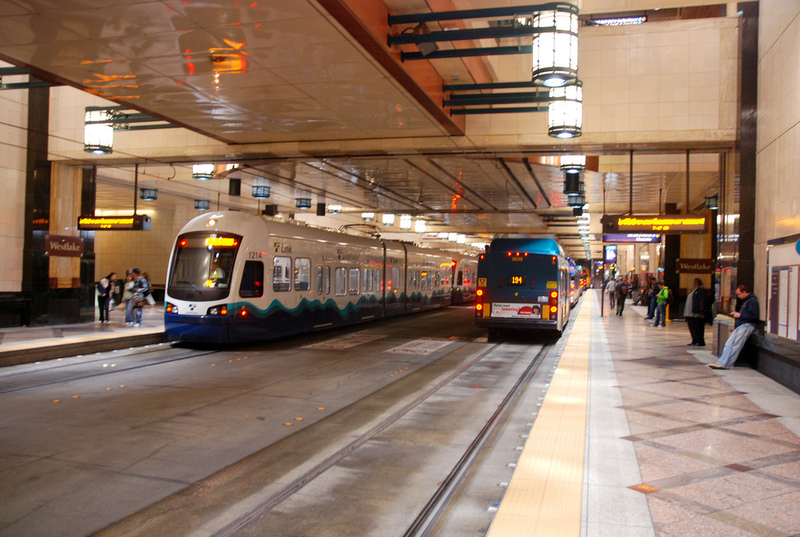 The 99 B Line moves over 5,000 people in a peak hour – and does that without any significant traffic priority and on an urban street, not a freeway. Railway lines all over the world regularly move 20,000 to 30,000 people per hour. We simply cannot accommodate the expected increase in population that is coming to this region unless we have more and better transit, which makes denser development possible. And most people acknowledge that. The current argument is how to pay for that. The province did a good job of persuading people that $3bn in freeway expansion was a good idea – even though tolls on the Port Mann have yet to meet expectations – but seems incapable of understanding that transit expansion is a much more effective investment. Nancy, I regularly take electric-powered trolley buses, the Canada Line or SkyTrain. These vehicles move tens of millions of people a year without burning one drop of petroleum fuel. TransLink’s diesel bus fleet services mostly the suburbs outside of Vancouver’s very efficient trolley wire network. Even though they are subject to the peaks and valleys of the world price of oil*, they are still also one of the most efficient and affordable forms of transportation. *Even with the 35% recent drop in price, it remains ~450% higher than only 15 years ago. Oil dependency imposes a steep cost on our cities. Stephen and Red Frog articulated the affordability of transit well, and how the port really doesn’t need ten billion bucks in additional road space. I would add that at the time of Kevin Falcon’s announcement on the “absolute necessity” of expanding the capacity the Port Mann by 250+% using precious public debt dollars supposedly for trucks, the actual mode share of single occupant vehicles on the bridge was 72%. They literally blocked access to the bridge for buses and trucks for decades. So here’s an idea, Nancy. Instead of putting 10 billion into road space that will not actually have an equitable payback, let alone NOT create even more congestion, why not alleviate existing road space by moving more people instead of more cars at a fraction of the cost? One bus can remove ~40 cars from the road. One 6-car LRT or SkyTrain train can remove ~300 cars from the road, the vast majority of them single-occupant. With a 1.5-second following rule (no one here uses the 2-second rule), that’s 6.3 kilometres of highway lane freed up by trains. Put another way, that’s 21,420 m2, or 5.3 acres of urban land worth millions. This car dependency vs. transit math can be very informative about how we have designed our cities, and I predict that someone in a position of power will eventually figure out that there is an affordability ceiling on tax dollars supporting wastful road projects with highly questionable economic return. In the 90s Transport 21 report it was calculated each car in the Lower Mainland was subsidized to the tune of $2,700 a year, all road maintenance, land acquisition, insurance, emergency services, healthcare, litigation and environmental costs accounted for. With today’s 1.4 million cars, that’s $3.78 billion in ANNUAL subsidies. Clearly, transit-oriented cities will become the paradigm of the 21st Century despite governments who are stuck in a 1950s time warp. So, SkyTrain is the “most expensive” form of transit in the world, eh? Bring it to ground, as they propose on a long stretch of the Fraser Highway alignment and the cost difference with LRT disappears. Still, you have a point about extending it to low-density Langley City at present, so let’s stick with buses for now. In other areas SkyTrain provides a superior quality of service where one 6-car train arrives every 75 seconds (e.g. the downtown stations at rush hour). With a few keyboard strokes that can be increased to 60 seconds. To accomplish that with surface LRT you’d need a troop of union-scale drivers waiting in the wings at great operating cost, and a dedicated median with no level crossings where risks are higher. In terms of full accounting where life-cycle per-passenger costs, life-cycle benefits and other long-term calculations are not ignored, SkyTrain is the superior choice. You wondered about my car. Well, it’s a very efficient late model sub compact that gets 9.8 km / litre in the city (actual road tests) and is expected to top 13 km / litre on the highway. Still, my commute is less than 15 km, and I take transit about 25% of the time during the week, and 90% of the time on weekends. My neighbiurhood has a decent and growing walk score, which takes the pressure off driving for groceries or to have coffee siomewhere. Our next car will not be considered for at least 15 years, well into our retirement, and then it may be a co-op car share used when we’re not walking, biking or taking transit. Most people on my block and in my workplace own far less efficient vehicles, or have multiple vehicles in their families. To me, that is just a sign of how addicted to the costly oil-car paradigm our society has become, and just how difficult that will be to change. On the other hand, I went a decade without owning a car and lived where everything was within walking distance. I also note that 40% of West Enders do not own vehicles. Nancy, if you bothered to go outside B.C. for example to Toronto and Montreal, you would find that SUBWAYS are way more expensive than SkyTrain/ Canada line…. SkyTrain and Canada line are Light Rail Transit systems that are automated. Not all tramways (LRT) run only at street level. Depending on the city they can run underground or on an elevated guideway…just like SkyTrain..